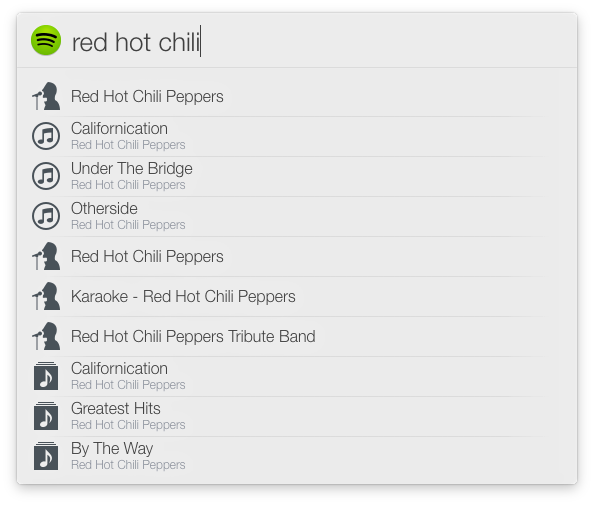 - Now displays up to 3 songs, 3 artists, and 3 albums like Spotify. The best result will still rise to the top. Last edited by Nosrac on Wed Aug 13, 2014 3:34 am, edited 3 times in total. Anyone with a little expertise mind helping me figure out something? I want each result to open a URL as its action. What's the best way to do that? Looks great, but doesn't work on my system. Action always responds with "TypeError: 'undefined' is not an object"
Nosrac wrote: I want each result to open a URL as its action. What's the best way to do that? By the way, with LaunchBar bundled are pretty nice music related icons. TheEndless wrote: Looks great, but doesn't work on my system. Action always responds with "TypeError: 'undefined' is not an object"
Would you try downloading again? I think manfred's help might've fixed this. I just fixed a bug that broke "free form" searches, that wasn't your problem was it? check for messages from LaunchBar. Usually this gives more informations why the action failed. Downloaded the latest version, still get the same error. I'm in Denmark (and a Spotify subscriber of course). Also, I'm using an Alfred Spotify workflow that works just fine. Thanks for posting the output Ayla. You are trying to open the action with return, right? Pressing space should work fine. Nosrac, the reason for this issue is that you do not define a run function in your default.js file. We will improve the alert text in the next version of LaunchBar. Yes, it works using space instead of return. But, no matter what I search for ("Madonna" for example), Spotify tells me: "Your search did not match anything in our catalogue.....", when I press enter on the result in LB. I'm using the latest Spotify Desktop app. Ayla wrote: Yes, it works using space instead of return. Hey Ayla, I think my last update caused this bug. Would you update again and let me know if it works for you now?